Maximize your budget with the 19” NEC AccuSync AS193i, an LED-backlit IPS LCD desktop monitor that enhances desktop computing with eco-friendly benefits. The latest addition to the NEC AccuSync Series, this value-driven model touts features such as an IPS panel for outstanding image performance, ECO Mode™ to extend the life of the display, tilt adjustability and Intelligent Power Manager. The AS193i is mercury-free, consumes little power and generates very little heat. Additional benefits include a carbon footprint meter and Rapid Response technology, both of which make this model ideal for classrooms and small-to-medium-sized business environments. 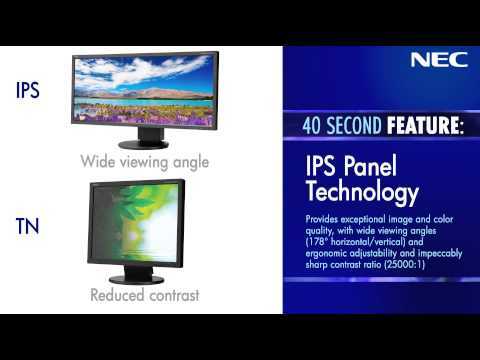 Panel Technology IPS Viewable Image Size 19 "
7.5 lbs. / 3.4 kg. Enables a security cable to be attached to the projector.